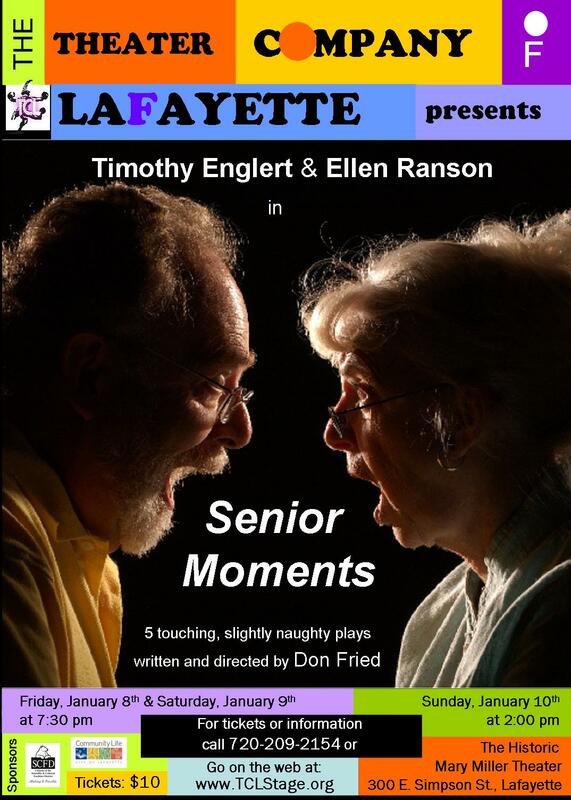 Senior Moments, my latest full-length play, premiered the weekend of January 8th at the Theater Company of Lafayette, Colorado. The theater was absolutely packed for all 3 performances, and we had to turn away quite a few people. We’re considering putting on an additional run this summer, so watch this space. Thank you to the Longmont Times-Call and the Boulder Camera for their great coverage. Click here to read the Times-Call article. Moments is made up of five funny, touching, slightly naughty short plays for and about people living in retirement homes.Moments consists of five funny, touching, slightly naughty short plays for and about people living in retirement homes. The opening of my play, “The Debate,” about Charles Darwin was this past Saturday night. I’m playing the role of Darwin in it. That’s me, hamming it up in the picture. But since I’ve started as a playwright, I’ve found that when I immerse myself in a subject, something invariably presents itself that has to be written. In this case, I soon became caught up in Darwin’s description of his relationship with Huxley. Darwin had formulated the bases of the theories of evolution and natural selection by the time he was 29, but he realized what social, religious and political dynamite he was dealing with. So he spent the next 20 years gathering more evidence and biding his time. Then a colleague named Wallace sent him a letter with many of the same ideas, and Darwin rushed “Origin of Species” out in a few months. A year later an impromptu debate occurred at the Oxford Museum of Natural History pitting the supporters of evolution against the Creationists. Darwin, who was ill and house-bound most of his life, wasn’t at the debate, but Huxley was and defended Darwin’s theories. In Darwin’s autobiography, he talks about how he would constantly chide Huxley for being so aggressive in attacking everyone who dared to question his (Darwin’s) theories. In contrast, Darwin was deeply into being a gentleman scientist and believed in dealing civilly with everyone. The action of my play occurs a few weeks after the Oxford Debate, when Huxley comes to Darwin’s house to tell him about what had transpired. And the “Debate” of the title refers to both the Oxford Debate and the heated debate that Darwin and Huxley engage in on a scientist’s responsibility to take into account the potential impact of his discoveries before making them public. Thoughtful stuff for a loose cannon like me, who has a habit of deciding what he thinks needs to be done and declares “Full speed ahead,” huh? The next day, I did a gig as Darwin at a Unitarian Universalist service in the area. The Unitarians, and the Universalists in particular, claim Darwin as one of their own. After speaking with the Reverend, I made up an extract from the play that seemed relevant to the theme of their service. In costume and with my phony British accent coming and going, I addressed the congregation. They seemed to enjoy it, and it was a real kick for me. I’d never been to a Unitarian service before, and I must say that it was a revelation for me. Much of what I heard was what has been going through my head for the last 50 years. It was a lot like coming home after a lifetime away. Small world, huh? Amazing that she’d recognize me after all these years. I guess it’s because I’m succeeding in my obligation to live forever and stay young and beautiful all that time. On the other hand, I do have a painting in the attic that’s getting old and ugly!